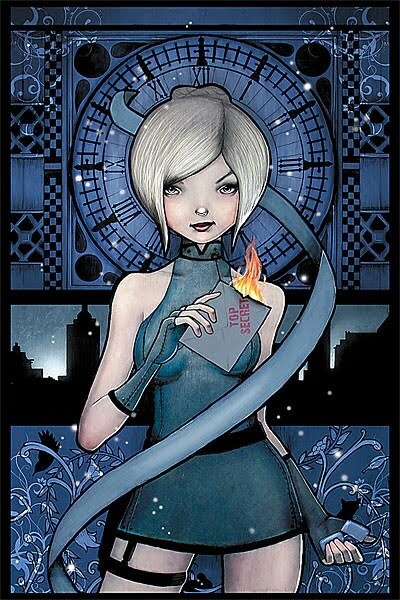 Long-time readers of Fables know Cinderella as a secret agent for the New York Fables, and here she is in her very own mini-series. Tasked to find out why magical objects are being put on sale for the mundy world, Cinderella soon finds herself deep within a plot that involves the Arabian Fables and her own past. Will her Bigby-trained skills, extreme beauty, and magical charms be enough to save the day? Only time will tell. Cinderella's first solo adventure in the world of Fables might well be her very last! I'd heard some good things about this series when it was coming out in single issue form, so I was happy to be able to pick it up from the library. I'm a fan of the Fables series (and its companion title, Jack of Fables), so additions to the world are always welcome. I was really curious to see what happened when another writer had the reigns of a world that's been so closely associated with its creator. The results aren't bad, but as with Sandman spinoffs (some of which Willingham himself has written) you can see a slight change in the property. I don't think that Roberson gets quite the same punch out of surprise appearances that Willingham does, for instance, especially the payoff at the end of this trade in the form of the villain. He's also taken a lot of the humor out of the book, replacing it with sexual tension that just didn't work for me. Cinderella's flirtation with Aladdin feels forced rather than natural, as though their personalities get put through the action movie machine and must say or do certain things. There's less a sense of finding a new way to use the characters from stories we all know and more using characters we all know to tell a story we've seen a hundred times before. That's actually my biggest problem with this mini as a whole. While Willingham is certainly no stranger to putting his characters into familiar ideas (including the aggravating Israel-Palestine political debacle), there's almost always a sense that these characters dictate how those tropes will play out. Here Cinderella and Aladdin play things by the numbers, with magical gadgets taking the role of more normal props as the only nod to who these Fables are. As we all know (and as Willingham uses to good effect), Fables are Fables because they can be placed in almost any story and feel familiar. I don't think Roberson quite manages that trick in this story. Cinderella could easily be anyone, from another Fable to Angelina Jolie while Aladdin might as well be Prince Charming or Leonardo DeCaprio. I don't mean to say that the story is bad. The plot itself is tightly woven and incorporates the things we already know about the Fables world quite well. I give Roberson (and Willingham by extension for creating her in the first place) credit for making this a book that's driven by strong female characters who do just about everything in the story. Women are the main hero and villain, and female characters fill out several supporting roles you'd normally see male characters in. Cinderella is in firm control from beginning to end, which is certainly unusual in an action story. She may be in danger, but it's not Aladdin's that's going to save her. It's Cinderella's wit and grit that finds a way. I just wish there had been more to make her feel real, and not just a Bond-like character whose female this time around. McManus has some really nice touches here, such as framing shots to have similar looks when Cinderella is going back and forth from her past to present. He also does a great job with facial expressions, capturing just the right look for Roberson's dialog. The art itself may not always be as crisp and clear as I'd like, but I love to see how he'll adapt the characters to whatever they're seeing, saying, or doing. If you're already a fan of Fables, Cinderella is a nice side-read, quickly finished if you're in need of more from the world that Willingham built. The pedestrian plot, however, never rises above every other action story you've read before, which means that this is not required for you to know what's going on in Fables. (You should, however, make sure you read the main story first because there are definitely spoilers in here.) I liked it fine, but I'm not about to try and get my own copy. If you like Fables a lot, give it a try and see what you think. If not, it's okay to let this one sit on the shelf. There's plenty of other action stories that do the job better. Cinderella may be the best Fable at what she does, but next time around, I hope we see a stronger definition of her character within the action world. That would definitely be a story I'd like to read.